Edward DeMarco, the controversial acting director of the Federal Housing Finance Agency (FHFA), may be replaced by the White House in early 2013. According to a recent report in the Wall Street Journal, the White House is planning to relieve Mr. DeMarco of his duties and is already considering replacements. This is a significant development that could help hundreds of thousands of mortgage borrowers who are hopelessly underwater on their home loans. DeMarco’s reign has been mired in controversy over his opposition to one key provision of the National Mortgage Foreclosure Settlement Agreement signed earlier this year by the five major lenders in the United States. That provision orders banks like Bank of America and Wells Fargo to write down the principal balance of existing mortgages that are greater than the value of the homes they encumber. 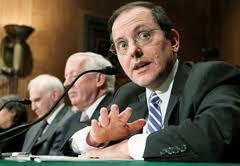 As the head of the FHFA, Mr. DeMarco has oversight of Fannie Mae and Freddie Mac. He did not approve of the mortgage write down provision on mortgages guaranteed by the two government-sponsored entities, citing that taxpayers would be overburdened by such a move. The principal mortgage balance reduction enjoys the support of the White House, but Mr. DeMarco has repeatedly argued that his duty is to ensure that taxpayers do not end up paying more than they already have when they bailed out Fannie and Freddie. Politicians have called for Mr. DeMarco’s replacement ever since he issued his pronouncement of no support for the mortgage principal reduction earlier this year. Due to regulatory provisions and the political climate in Washington, the White House has not been able to directly intervene and relieve him of his duties. For numerous homeowners who are underwater on their mortgages guaranteed by Fannie and Freddie, replacing Mr. DeMarco is a priority. Some of the names that are being talked about, according to the Wall Street Journal, include economists and academics who may be more receptive to White House influence on their stewardship of the FHFA. One of the potential candidates for appointment is Michael Stegman, who is already in the White House as an economic advisor to Timothy Geithner, the current Treasury Secretary who may soon step down from his post. Mr. Stegman specializes in housing finance matters, and his advice has shaped current housing initiatives supported by the White House. DeMarco’s replacement will be closely watched by mortgage bond traders, who are not particularly pleased by mortgage principal reductions that could devalue the instruments they make a living with.